Royal Mail has reported a 33% fall in annual profits and warned that market conditions remain "challenging" despite rising parcel volumes. Royal Mail chief executive Moya Greene said: "We have delivered a resilient performance in challenging markets." Parcel volumes at Royal Mail's European division, GLS, grew 10% while revenues were up 9%. That helped total group revenue rise 1% to £9.2bn in the year. The company's preferred measure of profit - adjusted annual operating profits before transformation costs - rose 5% to £742m from £740m a year earlier. Transformation costs included 3,500 voluntary redundancies, which cost the business £117m in the year. Overall transformation costs rose to £191m in the year. 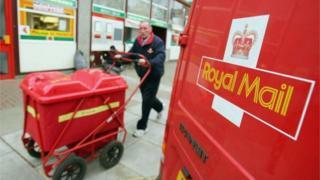 Royal Mail said it reduced costs at its UK parcels division by 1%, while net debt fell to £224m. It added the fall in annual pre-tax profits was the result of last year's results being boosted by the profit on the sale of its Paddington depot in west London.